The idea of The Towns That Built Me stems from the song The House That Built Me by Miranda Lambert. However, instead of just a house building me into the person that I am today, there are three towns that have built me. Each of these places has a very special place in my heart. Pella, being the town I grew up in. Dubuque, being the town I left home for, and Alcalá de Henares, the town where I began my world travels. In each of these places I have grown, learned, experienced, and created. I definitely wouldn’t be the person that I am today without having lived in each of these places. Since I studied abroad spring semester of 2017, I did not get the chance to take the Typography class that is only offered every other year, and is an upperclassman level class, so I couldn’t take it before I left. So, for my thesis, I decided I wanted to try to teach myself about typography and play with type. I also wanted a chance to show off some of my writing skills through some of the poetry I wrote during my time in Spain and some of my travel blog posts. 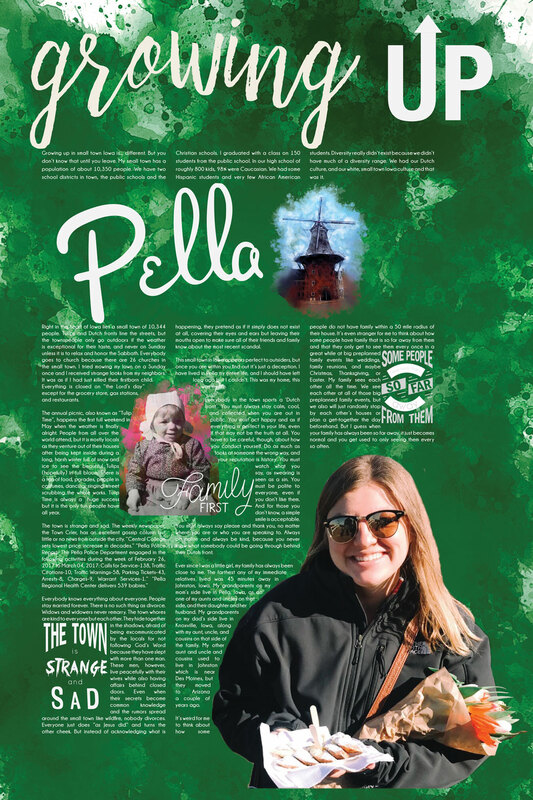 Pella is where I learned to always be polite and kind to everyone you meet because you do not know what they may be going through. It is also where I found my love for Jesus and the foundation on which my faith was built. Dubuque is where I learned that even though we may not all look the same and act the same, we are all unique and special in our own way. I also learned to push myself outside of my comfort zone and get involved in some things that I never dreamed of being involved in. Alcalá de Henares is where I learned that being on your own and being independent is one of the best gifts you can give yourself. The power to be in control of your body, your mind, your soul.